Julie Vorholt's career path hasn't followed one direct path which has provided her with opportunities to develop many skills. Julie shares a productivity tip which helped her to balance teaching and editing a massive new book for TESOL. I have been teaching ESL, EFL, and English for over 20 years. 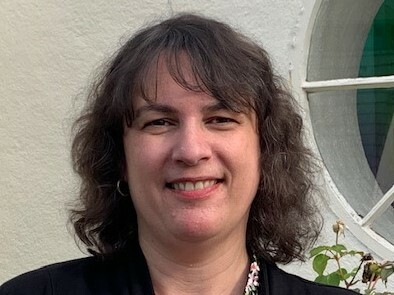 Since 2006, I’ve been teaching ESL at Lewis and Clark College in Portland, Oregon, USA while also working as a freelance writer, editor, and consultant. It may interest other teacherpreneurs to know that my career path has not followed one direct path. My entire career has been dedicated to the field of education, but I have not always worked in the classroom. For example, I worked as Employer Relations Coordinator at the San Jose State University Career Center and the Enrollment Manager and Career Services Director for Language Teaching programs at the Middlebury Institute of International Studies (MIIS). My career began in Ohio where I taught English to high school students until launching my international career in 1995. I taught and led the Foreign Languages Department at a private middle school and high school in southern Turkey for three years. That experience inspired me to earn my M.A. in TESOL from MIIS. I have also taught in China at a technology company and in various states in the USA and served as an English Language Specialist for the United States Department of State in Kazakhstan. My typical day varies a great deal. My ESL program follows a semester system where I get into a routine for 16 weeks. My teaching hours provide the foundation for the rest of my schedule. During breaks from teaching, there are no typical days. However, I do prefer to edit and write in the morning and afternoon. I do less precise work in the evening. I like exercising, especially walking and yoga. I also connect with friends via phone or online chats. After working on my computer, it’s refreshing to switch gears and be involved in experiences that use tactile and kinesthetic senses, such as cooking and dancing. 4. You took on the tremendous task of editing a book. Can you talk a bit about it? Editing New Ways in Teaching Speaking Second Edition was a huge project! The book is 286 pages long and includes more than 100 new activities for all proficiency levels and all ages. 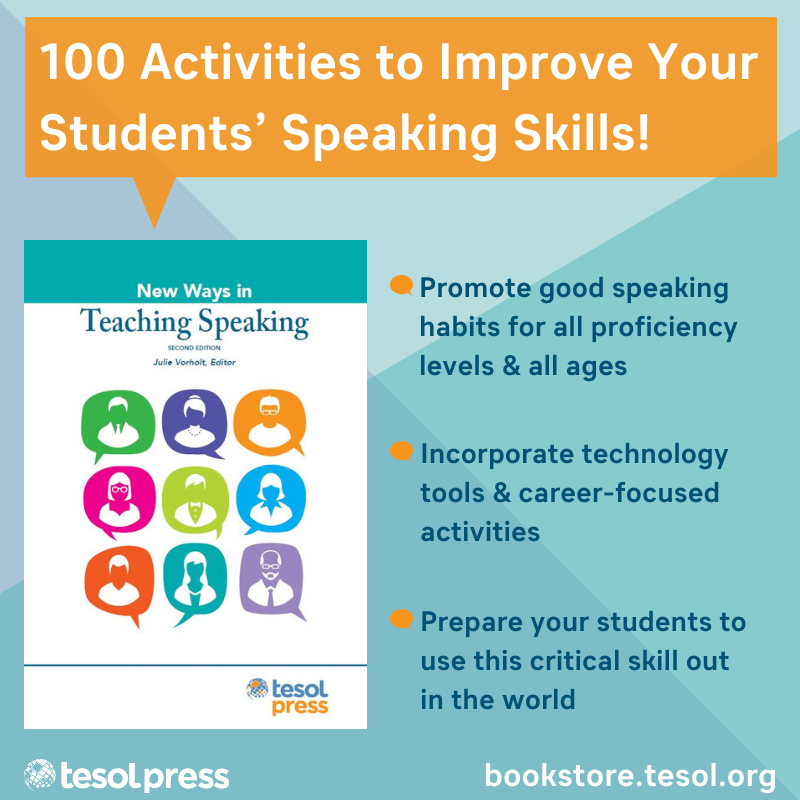 There are additional resources available at www.tesol.org/teachingspeaking, including over 40 online appendices with detailed, ready-to-print resources. Although I did not expect it to be so robust, I’m pleased by how comprehensive it is. Three free sample activities and the Table of Contents are available here. Some of your readers may be familiar with the book’s first edition from 1994. This 2019 edition has brand-new activities. Of note is an extensive new category Speaking and Technology. I really enjoyed reading the many creative ideas, such as using Angry Birds, Flipgrid, and Google Earth. There is also career-focused content in a subsection titled Spoken English for Academic and Professional Purposes where you can read my activity, “Elevator Pitch Competition for Environmental NGOs.” There are also other entirely new subsections, such as Game-Based Learning, Oral Presentation Skills, and Young Speakers for learners from kindergarten through grade 12. Although these activities are designed for English language classrooms in an ESL or EFL context, some can be used to teaching speaking to native English speakers and many, with a few modifications, can be used to teach speaking in other languages. I was committed to creating a book that teachers can use with confidence. As an experienced classroom practitioner, I rely on the quality of my materials. I edited each activity very carefully to produce a useful and reliable resource so that teachers and their students can have a positive experience. 5. You managed to balance teaching and editing a book. What is your best productivity tip? One of my philosophies is “slow down to speed up.” Rather than hurrying to jump into a project, I reflect on priorities, make a plan, and then fully focus on achieving it. 6. Just so our readers know, I wrote a book review for this excellent resource. How can we purchase the book? New Ways in Teaching Second Edition is available through the TESOL Press website at http://sites.tesol.org/Bookstore/. It is in the New Releases section. 8. What are you working on these days? My current projects are promoting New Ways in Teaching Speaking Second Edition, teaching, and volunteering as the Exhibitors’ Liaison for ORTESOL, the Oregon Teachers of English to Speakers of Other Languages organization. I'm also writing a series of blogs “On Teaching Speaking” for TESOL, announcing the book via social media channels and e-mail, and presenting at conferences and workshops. 9. What skills did you gain from classroom teaching that have allowed you to excel as a teacherpreneur? Teaching has improved my listening skills. In particular, teaching ESL has exposed me to many ideas that are outside the box or new to me. Related to being a teacherpreneur, I listen and try to meet all of my client’s needs and I’m open to multiple ways of reaching goals. In addition, organization and advance planning are helpful skills developed through teaching. 10. What have you had to do outside of your comfort zone as a teacherpreneur? I often find it difficult to toot my own horn. 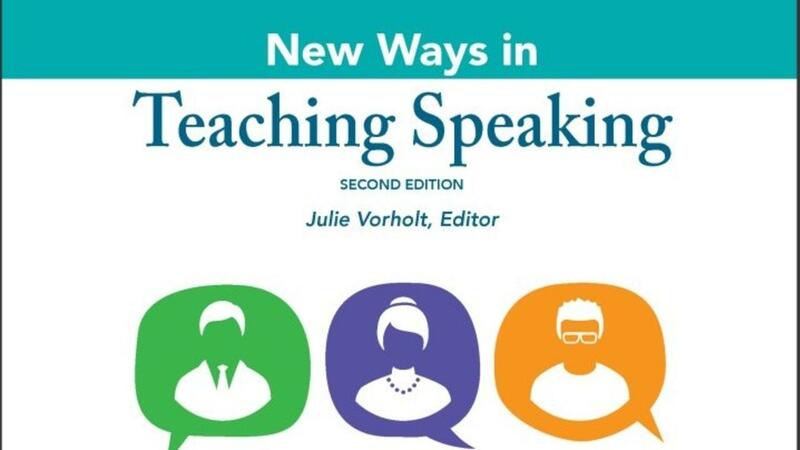 Talking to people about New Ways in Teaching Speaking (Second Edition) is helping me to grow because I enjoy talking about the fantastic lesson plan activities from the contributors. 11. I talk to many teachers about their fear or doubt in trying something new or "putting themselves out there". What advice would you give to these teachers? First, identify the source of your fear or doubt and then decide how you’d like to handle it. Second, ask yourself what you’re risking by not putting yourself out there. As the poet, Mary Oliver asked, “Tell me, what is it you plan to do with your one wild and precious life?” Time is finite. Why not take a chance? 12. Is there anything that you would like to add? Thank you for interviewing me, Patrice. I remember meeting you through the TESOL Materials Writers Interest Section and I have enjoyed seeing your career successes and observing the evolution of your work as a teacherpreneur!